Speaking on the occasion of International Women’s Day Radha Mohan Singh, Union Agriculture Minister said nature has made woman superior to us males in so many aspects of life and they are capable of providing a better cooperative leadership compared to men. 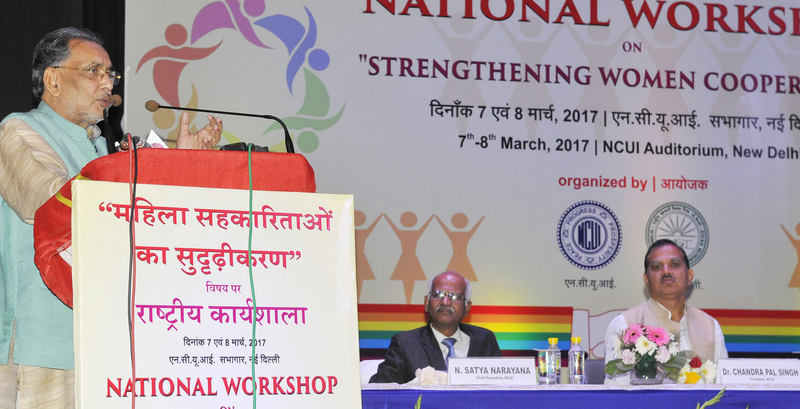 Singh was speaking in the Valedictory Function of National Workshop “Strengthening Women Cooperatives” organised by National Cooperative Union of India (NCUI) and National Cooperative Development Corporation (NCDC) on Wednesday in Delhi. More than 200 heads of women cooperatives were present. “Cooperatives are the only medium to remove poverty and for strengthening family life in the villages in which the role of women is pivotal. Let us make opening cooperative a public movement where women can play a leading role”, Minister said lamenting the insignificant proportion of women cooperatives in the country. Out of 8 lakh cooperatives in the country, there are just 20 thousand that are women controlled. Calling for ways to strengthen women cooperatives in the country, he said women cooperatives must come up in the field of dairy, fisheries, and even agriculture. He pointed out the important role of women in the dairy cooperatives ushered in by the White Revolution. He said the government is committed to bringing in Blue Revolution in the fisheries sector where women can play an important role. Singh said cooperative training programmes for women should be organized in large numbers, and they should be skill-based. The Centre has directed states to spend 30 per cent of funds allocated towards farm schemes for empowering women farmers, whose share is significant in the country’s agri workforce, Agriculture Minister said. Mirai Chatterjee, Chairperson, SEWA speaking on the occasion said SEWA will work with NCUI and NCDC to strengthen the women cooperative movement in the country. Earlier, Ms. Vasudha Mishra, Managing Director, NCDC said the national workshop created an awareness among women cooperative representatives regarding various loaning schemes of NCDC which can help women cooperatives. She said the women representatives during the workshop showed willingness to avail the financial loan schemes of NCDC but they wanted simple procedures for obtaining loans. She said the women representatives also desired training and marketing support from NCDC and NCUI. Deputy MD of NCDC Mr D N Thakur proposed a vote of thanks.